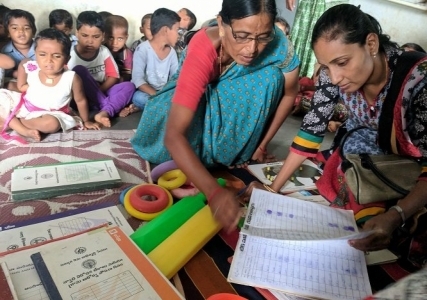 Govt., Aga Khan trust to digitise Anganwadi services data 2019-03-17 | Ismaili.NET - Heritage F.I.E.L.D. Apart from those who come to Anganwadi centres, the Anganwadi teachers will also visit families under each centre’s jurisdiction - catering to about 1,000 population - under the ‘Intintiki Anganwadi’ (house-to-house anganwadi) programme to explain the importance of nutritious food to every family member. The teachers visit five to six families each day and gather information about their food habits, nutritional value of their food intake, give suggestions to improve nutritional value in their diet, etc. “The idea is to impress upon the families about the close link between nutrition and health,” explained M. Jagadeeshwar, Principal Secretary, DWCD. They also talk about immunisation, direct the families to ASHA workers of the health department or to the health centre. “This effort is in addition to the services extended by the 35,700 centres across the State under 149 Integrated Child Development Services (ICDS) projects. The ICDS projects have a 75,000-strong workforce to deliver the services to women and children,” he added. The first 1,000 days, or three years are the golden period in the development cycle of a child and crucial time to extend care for health and nutrition. While children aged three to six years visit pre-school at Anganwadi centres and their nutritional supplement was taken care of by the centres, for children below three years, the nutrition supplement ‘Balamrutham’ is served at the doorstep of the child and the weight, immunisation schedules are recorded and monitored. Under the first phase, 11,000 Anganwadi supervisors were given smart phones to record and upload health data of women and children. The remaining centres will be covered in the second and third phases and data would be collected in three to four months. Anganwadi is a type of rural child care centre in India. They were started by the Indian government in 1975 as part of the Integrated Child Development Services program to combat child hunger and malnutrition. Anganwadi means "courtyard shelter" in Indian languages. A typical Anganwadi centre provides basic health care in Indian villages. It is a part of the Indian public health care system. Basic health care activities include contraceptive counseling and supply, nutrition education and supplementation, as well as pre-school activities. The centres may be used as depots for oral rehydration salts, basic medicines and contraceptives. As many as 13.3 lakh (a lakh is 100,000) Anganwadi and mini-Anganwadi centres (AWCs/mini-AWCs) are operational out of 13.7 lakh sanctioned AWCs/mini-AWCs, as of 31 January 2013. These centres provide supplementary nutrition, non-formal pre-school education, nutrition and health education, immunization, health check-up and referral services of which later three services are provided in convergence with public health systems.